Online exam PHP script helps you to create or manage a secure and stable online exam platform. These PHP scripts allow you to create unlimited exams and questions on the website in the fraction of time. You can build questions on the basis of categories like subjects, topics, subtopics etc. Also, the scripts permit you to create questions in the various format such as audio, video or chart related questions. The admin is allowed to create multiple type question along with questions like true-false, reading comprehensive, and a lot more. In this article, we have compiled a list of 5+ best selling online exam PHP script using which you can create an online test, and assign test. Further, you can also sell your tests and collect money with the help of integrated payment gateways like PayPal, Stripe and more. Using online exam PHP script, you can give customized certificates to the students for their good performance in the online exam. This helps to increase customers interest in your services. With the help of online exam PHP script, you can provide a user-friendly interface to your visitors. There are so many features available in these scripts. Read some more useful PHP script blogs too!!! Let’s have a look at each online exam PHP script in detail. You can create or manage your online exam website easily with the help of this amazing online exam PHP script. The admin is allowed to create unlimited subjects and questions category on the web page. Further, you can give a live chat support system to your users which will make your site more user-friendly. There is a separate student profile section, where after login with the authenticate ids students can give exams and view the result. In addition to this, the admin has a permission to view and manage each student profile from the admin panel itself. It supports payment gateways such as PayPal through which, you can collect money online from your users in a more secure way. The script has a sorted dashboard system from where the admin has full control of their website. They can showcase exams stats in the various forms such as progress exams, upcoming exams and more. You can display the result of any examination in a systematic manner along with the name and the date of the exam. Further, you can present the result in the graph and chart format. With the help of this script, you can create a question count table. Here, you can categorize the questions like total questions, totally easy, moderate or difficult. This will help you and your users to get the complete analytics of examination. Regular License – This plan will cost you $35 in which you will get free support, regular updates. Also, it has quality checked by Envato. Extended License – Buy this plan at $200 with all the features of the regular license along with advanced features and future updates. This online exam PHP script is best suited for colleges, schools, training institutes and more help you to create an online examination website and conduct exams in an accomplished manner. The script is very easy to install, you can create sectional and practice exams for students in a fraction of time. Also, the students can give practice exams before the login to their profile. An important feature is, it has a 4 column featured area where you can showcase your services like exams type, analysis, reports and more. Further, it has a newsletter subscription so, you can collect leads and connect with the users easily. You can add free, or paid learning management system where you can showcase video lectures, practice classes and more. Also, you can permit your paid users to download lectures, you can disable or enable this service according to your need. The script supports multiple payment gateways such as PayU, PayPal, and more through which you can collect payment online from your users. It gives you the beautiful layout for the frontend of your website. 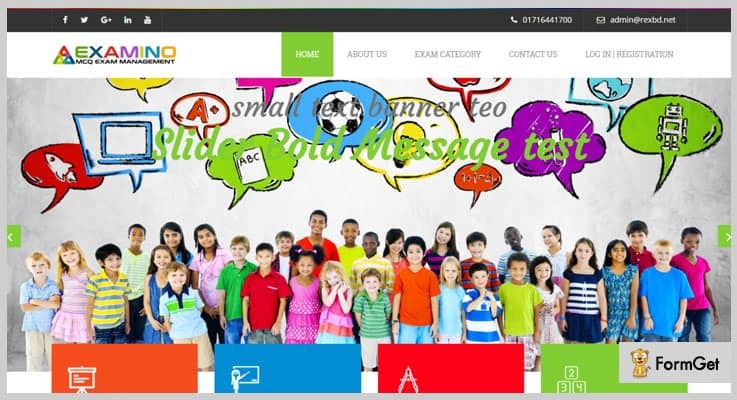 Moreover, you can manage your website by applying various useful themes and colors to give it a better presentation. This online exam PHP script is very secure, your users won’t be able to copy or print the exam content. As you can disable the cut, copy keys functions according to your choice. MenorahOES PHP script is available at a reasonable price of $60 with 6 months support. Further, you can extend your support up to 12 months by paying $20.63. The extended license of this plan will cost you $195 with regular updates, advanced features and quality checked by Envato. If you want to create a website which helps you to build an online exam, quizzes, and tests then, this Examino PHP script is made for you. Examino not only help you to create exams quizzes on the online platform but it also helps you to arrange a paid exam system. Also, it provides a proper exam result system and a lot more. The script provides you with professional layouts. Further, it has custom certificate generation through which you can give an online certification to the students and more. It has a beautiful full-width slider where you can display full-size images. Further, it has a useful 4 column featured area where you can showcase your services in a systematic manner. 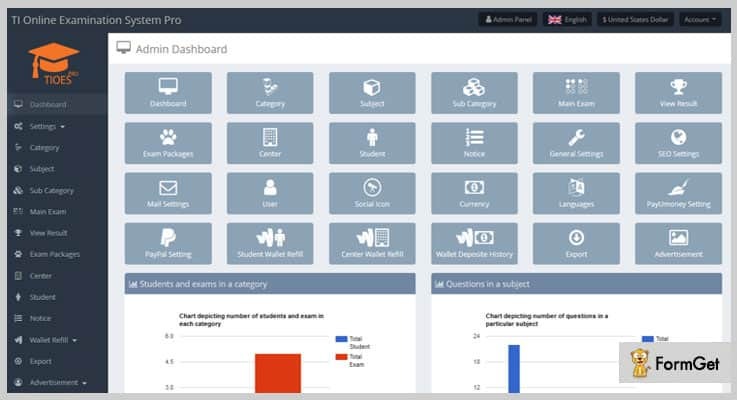 The admin can view and manage a total number of questions, exam category, all the users and a lot more in the admin panel supported by this script. You can collect online money from the users for paid exams with the help of various payment gateways such as PayPal, Perfect Money, and Stripe. In the exam category area, you can place various exams along with their price, and time on the homepage of your website. Also, you can place some free exam on your site for the trial purpose. Get this online exam PHP script at a reasonable price of $31 with quality checked by Envato. Also, you will get future updates and 6 months support. The extended license is available at $155 where you will get all the features present in the regular license as well as some advanced features. This is one of the finest and easiest online exam PHP script which is used to create an online test for students. The script helps you to create exams easily, with the help of a simple drag & drop system. The noteworthy feature is, you can place audio based questions which helps users to listen to the question, and answer it properly. Moreover, the users are allowed to review questions and answers before submitting the paper. It has an internal communication chat system through which students are allowed to send the message to the admin panel. It helps them to connect with the qualified teachers for clearing their doubts within few minutes. You can place various types of questions such as optional questions, fill in the blanks, true-false, yes/no, short answer and a lot more. The admin is allowed to categorize the exams in various forms such as the favorite exam, my exam and more. This helps you as well as the users to differentiate the exams instantly in just a few clicks. 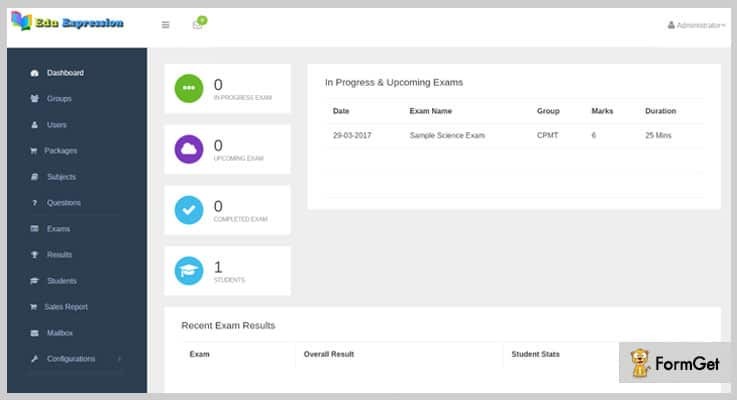 With the help of this script, you can manage all exams result in the admin panel. In addition to this, the result can be shown with student name, state, type of exam, maximum and gained marks etc. Buy this online exam PHP script at $35 with 6 months support and regular updates. Further, the extended license will cost you $175 which offers you more enhanced features and services. If you are having an educational institute with many branches then, this script helps you to build a nice online exam conducting system. This script provides three type of dashboard these are center, admin, and student dashboard. 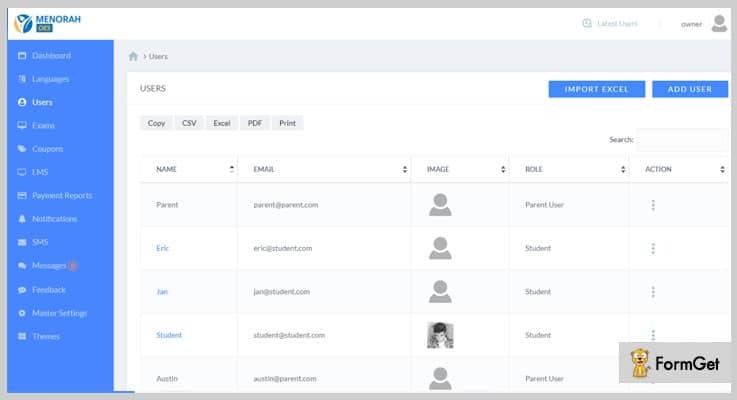 It gives the separate access panel to students, admin, and the center admin of your institute. With the help of this script, you can conduct online exams which are paid as well as free. The free practice exams are given by student for practice purpose only. Further, it supports more than 20 languages so, you can allow the users to give exams in various languages according to their choice. You can categorize the exams on the basis of pricing and collect money for the paid exam. The script supports various payment gateways like PayUMoney, PayPal and more. In the center admin dashboard, there are two different internal notification section. One is for students and the other for admin. Here, the website owner can notify students and organizer about the new exams updates. The admin can add questions in the form of audio, video, image questions and more. It helps you to categorize exams on the basis of subjects, question type, length and a lot more. The script allows you to create a custom certificate which you can provide to your users in the PDF format. Whenever the student performs well in the examination they will get this certificate. Moreover, it will help you to connect more with students. You can buy this online exam PHP script at $200 with future updates. Further, the extended license is available at $1025 where you will get enhanced features and quality checked by Envato. EduEx PHP script helps you to add more functionalities to your online exam website. Also, you can apply this script to create an online exam Android app. This is one of the most powerful scripts for conducting online examinations on the mobile device as it has so many features like customization options, inbuilt mailbox and a lot more. You can get main screen frontend, student dashboard, exam page and interface in your Android app as well as on your website using this script. In the admin panel, you will get an inbuilt mailbox where, you can compose, send or receive emails directly on the dashboard. You can categorize the exams on the basis of subjects, topics, subtopics and a lot more. Further, you can separate exams on the basis of free and paid plans. The admin collect money for paid plans with the help of payment gateways such as PayPal, Stripe and more supported by this script. It provides the detailed reports of students like subject wise analysis, group-based performance and more in the graphical format. In addition to this, users are allowed to view their answer sheet, this feature is enabled or disabled according to the admin wish. With the help of this script, you can place various types of questions such as multiple choice, fill in the blanks, passage-based questions and a lot more on your site. Also, admin can display questions in the audio or video format. You can get this online exam PHP script at $85 with 6 months support and regular updates. Also, it’s extended license will cost you $1724 which offers you more enhanced features and services. This is all about the 5+ best selling online PHP script. We hope after reading this article, you will find the right script which can help you manage and create online examination website. All the above-mentioned scripts are best as per our knowledge as we have compiled them after a long research and testing. If you have any queries or suggestions, feel free to ask in the comment section below.